During the high school years, North Clackamas Christian's rigorous, fully accredited curriculum focuses on helping students become increasingly independent learners, preparing them to succeed in high school and beyond. 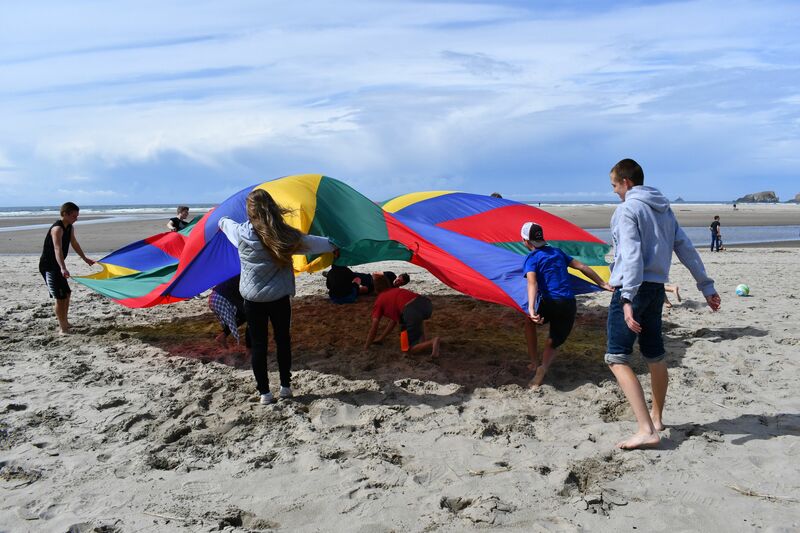 All boys and girls are also eligible to participate in a number of OSAA (1A) interschool athletic programs such as cross country, soccer, basketball, volleyball, baseball and track. In addition, our state championship choir program provides a strong balance to our outstanding academic regimen. The high school curriculum is standards-based and follows Oregon state guidelines for graduation requirements. Courses of study include Bible, technology, fine arts, music, government, economics, physical education, health, foreign language, English language arts, science (including algebra I/II, college algebra, geometry, pre-calculus and calculus), business, and social sciences (including world history, U.S. history, government, economics, geography, psychology). Advanced Placement (AP) U.S. History is available for 11th grade. All high school students are also required to perform at least 100 hours of community service by the end of their senior year. High school students participate in a weekly 40-minute Chapel with junior high students each Wednesday between first and second period. Chapel praise and worship is student led followed by a guest speaker or family groups and prayer. NCCS also has concurrent college credit partnership agreements with Grand Canyon University (GCU) and Clackamas Community College (CCC). GCU courses are online programs taken on campus in our media center from September through June each school year. Students in grades 10-12 are able to complete a full year of college courses prior to graduation. NCCS students are also eligible for up to $40,000 in tuition waivers ($10,000/year) if they attend GCU at their Phoenix campus after high school. NCCS also offers concurrent Clackamas Community College credit for select upper division math classes taught by NCCS instructors on our campus. Overseas Programs and Mission trips are an important part of the secondary experience. Students are encouraged to participate in one or both of these programs prior to the end of their senior year. The academic day for high school students begins at 8:15 a.m. and concludes at 3:15 p.m. Each day includes seven classes in 54-minute periods, with a zero period class beginning at 7:20 a.m. for Excelsior Choir or Quartets. The school year typically runs from early September through mid-June. CONGRATULATIONS TO OUR NCCS STUDENTS! Students from 30 different high schools competed in 10 subject areas. 1st place winners receive a 12-credit tuition waiver; 2nd place - 8-credit tuition waiver; 3rd place - 4-credit tuition waiver. Tuition waivers may be applied to any term for up to two years after high school graduation.